Inspired by the royal wedding in this month of May we took a look at all things royal in the collections. 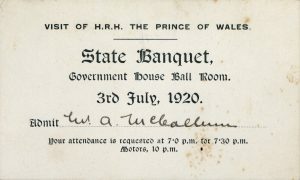 There are no royal wedding invitations but we did find Object #43, an invitation to a State Banquet held on the occasion of the visit of Edward, Prince of Wales, in 1920. Designed by Mr A E Pickering; printed by the Government Printing Office. 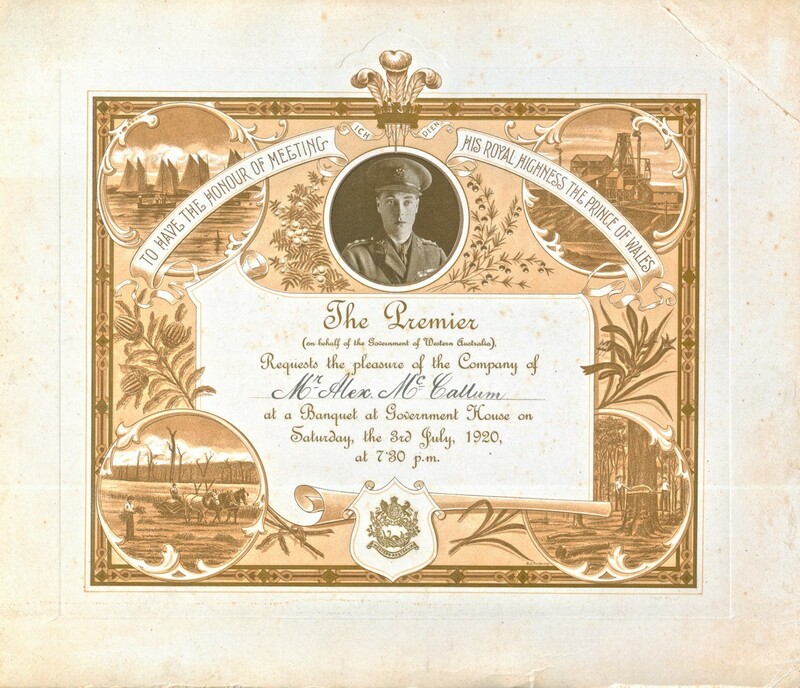 The invitation, printed in sepia, is unusually large for official invitations, and designed to fill a picture frame or album page. The State Banquet, held in Government House ballroom on the evening of July 3rd. 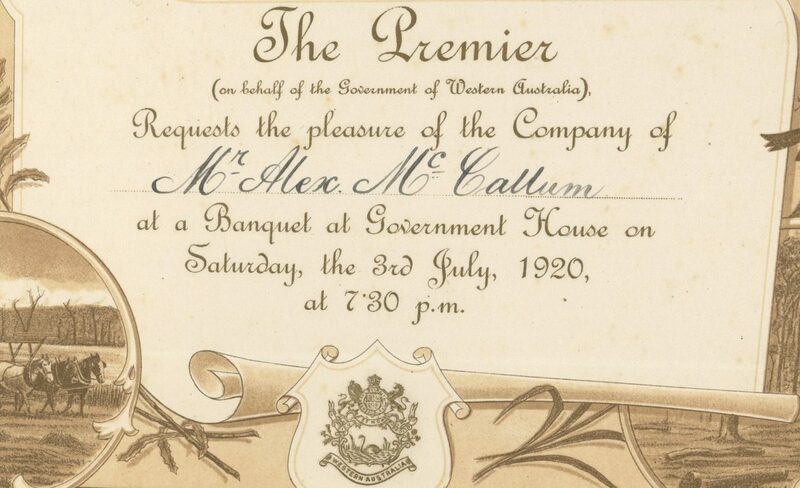 Among the guests, including the usual Members of Parliament, senior church men and government officials, was the recipient of this invitation, Alex McCallum, who had served as a Member of the Repatriation Board 1918 – 1920. By several accounts, this was a very male dominated banquet. Since 1902 women could vote and stand for election in Australia. However, at this State Banquet, it was men seated in the main tables in the ball room, while the ‘ladies’ were seated above in the galleries. Organisation of the banquet was not without some challenges as the State Reception Committee sought the loan of cutlery, glassware and table linen to cater for the large number of guests, from the Parliamentary dining room. The request was apparently declined for reasons ranging from the time taken to launder table cloths, to the risk of souveniring of the cutlery. (The West Australian, Fri June 25 1920, p6). As if this wasn’t enough for the caterer to contend with, the Hotel and Restaurant Employees Union alongside other unions mounted a campaign for extra pay during the visit. Somehow, enough glassware and linen was found, the banquet proceeded, and was reported to be a great success. Temptation did prove to be too much for one ‘uninvited guest’ Walter Bertram, who having gained entry to the Ballroom and being provided with a meal by the caterer, was arrested when a police officer found him with one dozen spoons and other items concealed on his person (Daily News, Mon 5 July, 1920, p7). Despite the negative aspects of locals stealing the cutlery, and a train derailment involving the Prince’s railway carriage, the visit by the popular Prince was considered a great success. The Prince of Wales’ visit was followed several years later by the visit of the Prince’s brother, the Duke of York, and Duchess of York, in 1927. By this time Alex McCallum was a Minister in the West Australian State Government and was invited to a number of the official events. Records of many of these, including invitations, entry cards, photographs and the published Souvenir of the 1927 visit may also be found in the McCallum collection in accession JCPML00821. On the death of his father George V, the Prince of Wales became Edward VIII, briefly. He abdicated in favour of his brother, the Duke of York, George VI in December 1936. Neither visited Australia again and for some time royal visits were something of a rarity. Alex McCallum kept many records and souvenirs reflecting his personal interests, travel and political career. His collection has ensured the preservation of these mementos of earlier royal visits to Western Australia. Next Next post: 44. Minister McCallum’s Press Cutting Album, 1924-1928.